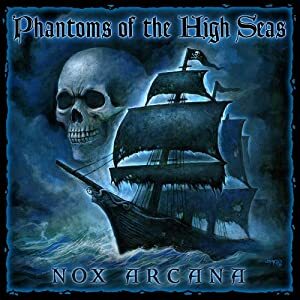 Phantoms of the High Seas is another concept album and obviously the theme this time is ghost pirates and the horrors one might find out at sea. More than any other of their albums this one seems to be more oriented toward battle or action tracks. My favorite track on here is “The Gallows Jig”. It is a shorter track but is not like much of Nox Arcana’s other works. As you’d guess by the name the song is an upbeat track, a jig that any ghostly pirate could dance too. “Still Waters” is a another good track. It is slow and creepy and there is minimal amounts of melody compared to most of their other songs. “Maelstrom” is a short sound fx track which sounds like a ship creaking in the midst of a storm. “The Fog Rolls In” is another creaky boat sound fx track, this time instead of a storm there are ghostly whispers and a ringing bell.